Monday, April 29, 2019—Opening Day at Little Cubs Field, 6pm. First Pee Wee League Little League game. Special guest TBA. Saturday-Sunday, May 25, 26, 2019 Memorial Day Weekend— 13th Annual PeeWee Classic. 7-8yr. olds from all over the Midwest are invited. Championship bracket games played at Little Cubs Field. 16 teams have entered and the field is full. Games start at 9 am each day, with a Homerun derby for everyone on Saturday night at 6 pm. Want to play? Call Denny Garkey 815-235-5318. Saturday, August 10, 2019 3nd Annual Blitzball Classic at Little Cubs Field. Blitzball wiffleball tourney for ages 13 and up, to benefit Pediatric Cancer Institute, the charity of Jon Lester of the Chicago Cubs. Games from 9 am Saturday to 7 pm. Details to follow. 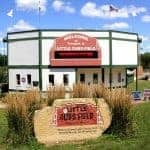 In addition, every weekday, Monday-Friday from April 22nd to June 21st at 6PM the Freeport Little League plays at Little Cubs Field. Free admission to all events at Little Cubs Field!